I’m almost embarrassed to share this with you. It is so stinking easy, but so delicious. 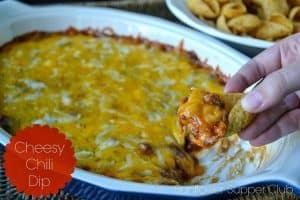 I’ve had different versions of this dip, all made with canned chili. Trust me, using your favorite chili recipe takes the dip to a entirely new level. We eat a lot of chili, and I always make a huge batch. This is a great use for the leftovers. Frankly, I can’t believe I’ve never thought of this before. Spread the softened cream cheese in the bottom of a dish. Top evenly with the pickled jalapeños, Chili, and shredded cheese. Bake in a 350 degree oven for about 25-30 minutes until cheese is melted and dip is bubbly.